Here at Braddock Motors, we put effort into helping our customers to get the most utility out of their vehicles. One style of vehicle that is renowned for its great utility is the pickup truck. That said, these vehicles come in many varieties that offer distinct size, power, and accommodation advantages. To this end, it can pay for prospective truck owners to have a solid understanding of the various types of truck cabs. Most modern truck cabs come in one of several varieties. These truck varieties include Standard, Quad Cab, and Crew. Each of these truck cab varieties offers drivers and passengers a number of unique benefits. 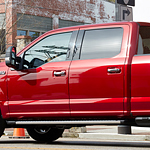 Standard pickup truck cabs are the shortest variety and consist of two doors and a single front seating area. These types of trucks often offer significant towing and hauling capacities, and thus do well for work-related purposes. Quad Cab models offer a little more leeway in terms of passenger comfort. While by definition this type of truck is listed as having four doors, it actually has two full doors and two rear doors which open only when the front doors are ajar. This construction style allows Quad vehicles to house rear seats with reasonable amounts of legroom. The third major type of truck Is the Double Cab. Much like Quad models, Double Cabs have four doors. In this case, each door is a full, independent door in its own right. This style offers rear seating room and accessories that are comparable to a four-door sedan. As such, this style is the most passenger-friendly of the three.